Damiana is used as a general tonic for the nervous, hormonal, and reproductive systems. It has an ancient reputation as an aphrodisiac. Some claim damiana tea has a relaxing effect not-unlike low doses of cannabis. Others argue that Damiana has no active ingredients, and that its medicinal reputation is based on damiana tonics from the late 1800s which were inactive, or contained enough alcohol and/or coca to produce unrelated effects. A shrub that grows up to 2 meters tall, and has a woody, heavily branched stem. Leaves are pale green with hairy ribs. 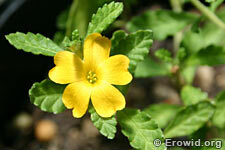 It bears small yellow flowers and inconspicuous fruits in a rough, three-chambered shell.